Sheela Bhatt meets Rashtriya Swayamsevak Sangha chief Mohan Bhagwat at a media interaction in New Delhi. She says that while he was rigid on his stand on the Ayodhya issue, he impressed with his simplicity and clarity of thought. "Hindu society in India wants to see a Ram temple in Ayodhya. I can give you my response to the court's judgement only after September 24. There is legal option available too. It will all depend on the judgement. But, our response will be within the limits of law and constitution. It will be in a democratic way. We will be striving to see that there will be a grand Ram temple on that site," said Mohan Bhagwat, chief of the Rashtriya Swayamsewak Sangh speaking on the much-awaited Ayodhya verdict. In an interaction with journalists of the Indian Women's Press Corps in New Delhi, he not only explained why he wants the Ram temple in Ayodhya but also conceded that they demolished the Babri mosque and explained why did they so. He said, "The Ayodhya issue is not a Hindu-Muslim issue. Ram is worshipped in millions of Hindu houses. But, that's why we are not running the movement for a Ram temple." He explained further that there is centuries old lifestyle, which has certain codes, which appreciates Ram as an ideal entity. Bharat's emotion (bandhu bhav) for his brother Ram is appreciated and understood not only by Hindus, but common Muslims as well. These values are national in character. Our country is surviving on those national values. He said, "To uproot (free) those values we demolished the mosque. (Un mulyo ko udhwast karne ke liye humne masjid ko toda hai). Now, we are freed so we should re-establish something like a national museum in the form of a Ram temple." He even said that if a temple is built in Ayodhya, it would reduce the distance that has been created between Hindus and Muslims over other issues. "We want the temple on the birthplace (of Ram). There was a temple there. That temple was demolished to break the will of the people. While disrespecting values, they demolished the temple." He thinks that re-establishing a temple will reset those values that were hurt at the time the of rule of Mughal emperor Babar. "The opposition to the temple is not justified." There is not an iota of change in RSS's stand on building of Ram temple at the site in Ayodhya where the Babri mosque was demolished on December 6, 1992. But, Bhagwat, the all-powerful leader of the 85-year-old outfit, is promising that there will be no violence whichever way the Ayodhya verdict goes. Bhagwat is the sixth sarsanghachalak of the RSS. His father was a prant pracharak (branch leader) and he himself had been pracharak for more than 25 years. No doubt, he breathes and lives on the philosophy of the RSS. In spite of prodding by women reporters, he gave no concession to the liberal view over the Babri mosque-Ram temple issue which will suit 21st century India, which wants development first and doesn't want to remain mired and divided over religion, caste or class. When the journalists argued with Bhagwat that if the RSS wants to unite India and wants to see it on path of progress then the solution to have joint structure at the site in Ayodhya could serve both purposes of unity and development, he stuck to his views. When asked specifically what is his precise problem to have some kind of joint structure or all-religion structure on that site to solve the issue forever, Bhagwat said, "Ayodhya is not about the religion, it's about the re-establishing national values. Why should anybody object to it?" He insisted that construction of the Ram temple would integrate India in a big way. He said, "The basic problem is that people are opposing the Ram temple." In the comment that can offend the secular people, he argued further that, "If tomorrow, Muslims say that let the temple be built then nobody will be able to say in India that Indian Muslims are 'foreign-bound'. (Bharat main koi nahin kahe sakega ke yahan ka Muslman videsh-parsat hai)!" He said from the side of RSS there should be no apprehension of violence. Peace should be maintained because Ayodhya is not the issue of conflict, he said. More than an hour's engagement with media proved that RSS don't change its stand even a century passes by or a new one arrives. He said, "Why should one change views with the change of time? Roots of a tree remain same and firm even with the changing of time." When asked about his view about the divisive character of the Ayodhya issue that has created distance between Hindus and Muslims in the country, he said, "We don't want any division in Indian society. If some issues create distance it's our duty to fill the gap." He said that till some time back RSS was not into dialogue with the Muslims. But, since the last seven years RSS is having regular dialogue with Muslim leaders. When asked repeatedly about the dialogue to maintain peace with the Muslim community after the Ayodhya verdict, he said that the Saints Committee, which is leading the Ram Janambhoomi movement, has dialogue with the Babri Masjid Action Committee and he doesn't have any clue about it. He thinks that when the Bharatiya Janata Party joined the temple movement it helped it but he said the RSS is not dependent on anybody over the issue. It stands firm on the demand that a grand temple should be built there, whether the BJP is with it or not. While he refused to budge from his rigid stand on Ayodhya, he did impress by his simplicity, dignity of language and clarity of thought. On the issue of radical Hindutva outfits like Abhinav Bharat and the Shriram Sene, he completely distanced himself from them. He said that he doesn't have much information on those organisations. And, then he said, "The RSS doesn't believe in violence and it's written in its constitution." Bhagwat said he doesn't believe that there is anything-called Hindu or saffron terrorism in the country. There is politics behind it to defame the RSS. When asked how he can object to words like saffron terror when they have been using words like jihadi terrorism, he said "Jihadi terrorism is a phrase used all over the world. Jihadi terrorism has got sanction by a 'particular philosophy' which supports violence. Hindu society doesn't sanction violence. So, saffron or Hindu words can't go together with terrorism." He reminded that whoever believes in violence and whosoever is motivated by external forces cannot join the RSS. He was in a denial mode when asked about the RSS's grip over the BJP. While smiling he said that he did not handpick Nitin Gadkari as president of the BJP. He said three-four names came forward that included Gadkari's name. Showing his maturity, he was very restrained in his criticism of the Manmohan Singh-led government in handling the Kashmir crisis. He said it's not RSS's job to criticise the government. "We are not an opposition party." However, he repeated RSS stand of 'integrating' Kashmir with rest of India and reiterated its opposition to Article 370, which gives special status to J&K. He said he doesn't like words like 'autonomy' and 'azadi'. He repeated the RSS views that Kashmir must be integrated with the rest of India. The policy of the government should be aiming for it. "How is it possible that by mere stone-throwing they want to dismiss the government?" He said that government should work towards making Kashmir an inseparable part of India in all senses. Earlier, while opening the dialogue, he said that, "I have come here to spread the understanding of the RSS." Then, in the typical RSS way, he explained that what the organisation stands for. He said that a country becomes great and contributes to the world when its ordinary society is united and virtuous. He said Dr B K Hedgewar founded the RSS in 1925 because he saw that awareness has spread in Indian society so independence will follow; but after attaining independence to run the country and to retain 'freedom,' one requires a society, that is united. 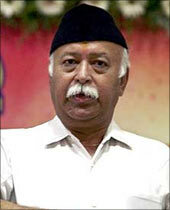 He said , "The RSS's work is of uniting the Hindu society. It is not the reactionary work nor is it in opposition to any community." He said, "Whoever wants to see 'Bharat mata ki jai' in this world can join any branch of the RSS." He claimed that the RSS doesn't believe in caste and nobody is asked about it when they come to join. He said the RSS has emerged as the strength of nation in the last 85 years. He was defensive about lack of women in the top leadership of the RSS. He said they have many programmes conducted jointly. The RSS wanted that caste census should not be conducted along with the census. He hoped that the caste census remains for planning purposes and not for politics. He also said that the 'Brahimin leadership' of the RSS is changing slowly. The dominance of the Brahmins has to do with its origin in Nagpur. In Nagpur, now the so-called scheduled castes are more than the Brahmins in RSS. At the zonal level, the caste combination is rapidly changing, and it will change at the national level too, he hoped. "We don't force the change," he added.